Tuesday, July 19th – Coulter Bay Village, Grand Teton National Park. Took showers at the facilities here at Colter Bay. Not as nice as Canyon or Grant Village. Ate breakfast at the full restaurant across from the marina. Dropped Christa off at the airport. Road our bikes to the Colter Bay Visitors Center; saw a documentary about the reintroduction of wolves to Yellowstone at the Colter Bay Visitors Center. Shopped at the bookstore and bought a Sibley’s book on trees, a book by the Muries and a National Park book. After lunch we attended a program by D.G. House, a Native American artist, who talked about “ledger art“. She was a very dynamic speaker and spoke to the clash of civilizations between the American Indian and the expanding United States. Had ice cream from the General Store (a recommended daily activity). Power went out. Everywhere. Heard over the Ranger frequency that it was a major power outage in Idaho. Started to read the book by the Muries. Hot dogs for dinner. 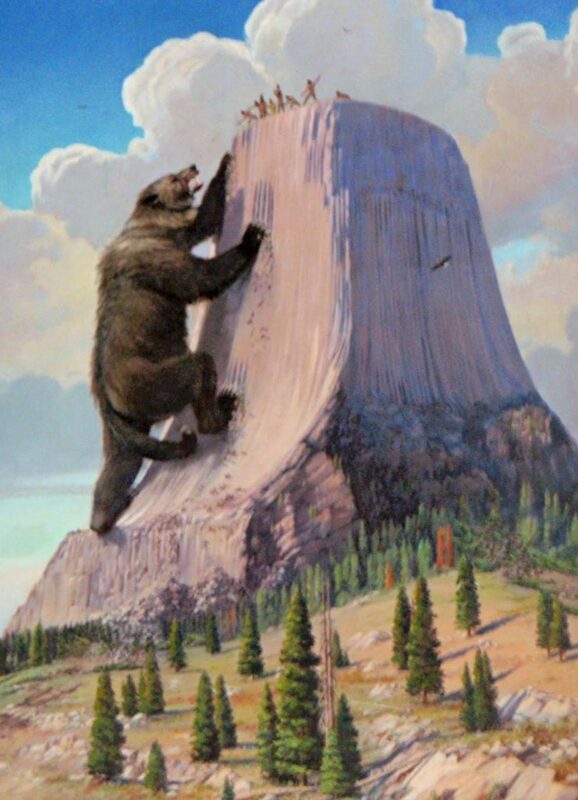 Attend the 7pm amphitheater program about bears (Ranger JJ, Steve Martin look alike). We then decided to go out and look for wildlife. 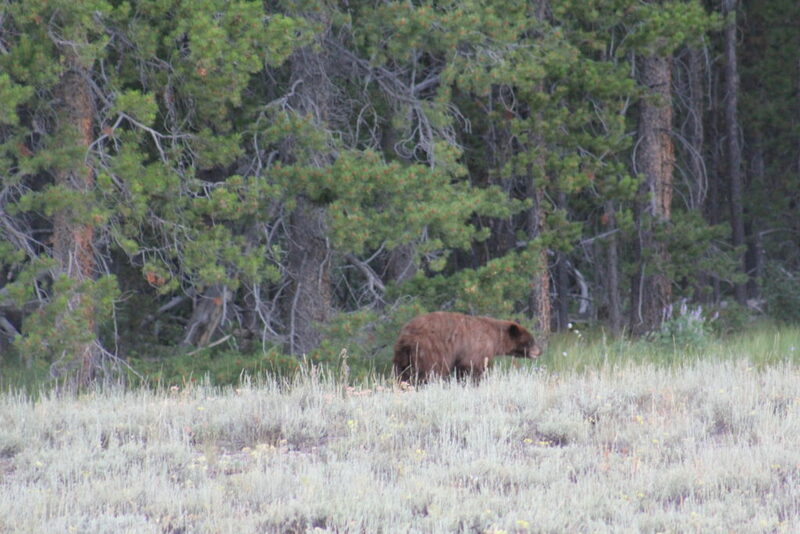 After striking out at Oxbow Bend and Willow Flats, a tip from the ranger frequency led us near Pilgrim Creek where we saw a black bear bounding between the tree line and meadow. Wednesday, July 13th – Grant Village, Yellowstone National Park. 9:30am Overlook Hike lead by Ranger Miles Augur. We left from West Thumb and started hiking up into the hills overlooking Yellowstone Lake. 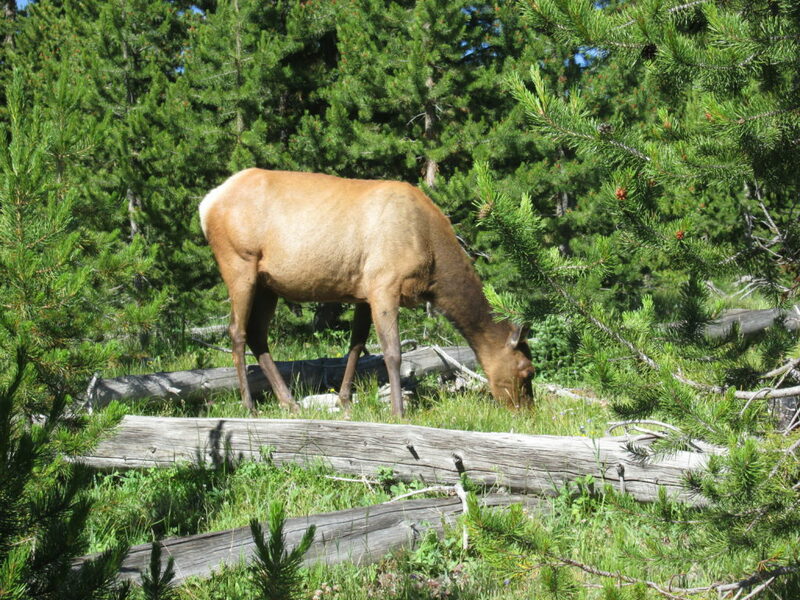 We ended up hiking through a group of about 8 elk. Perhaps the most amazing experience of the entire Summer. Trip to Old Faithful General Store to restock. Not a great selection, but not many other alternatives. Monday, July 11th – I have been regularly using my VX-8GR handheld to listen to the local NOAA weather radio station. The weather forecast last night was pretty grim. Temperatures dropping. Snow. Snow? In July? Yes. I decided to spend Sunday night packing up. Sarah helped me put the bikes on the station wagon. We put away the folding chairs and rolled up the awning. I had really been enjoying our campsite at Canyon (J200). The Canyon campground is huge. The camping sites are nice – lots of trees and separated at a good distance. Quiet. Canyon also has laundry facilities and showers. Both worked out well. They even have over sized washers and dryers for sleeping bags and comforters. But it was time to move. We’d been here over a week. We woke up to light snow. It wasn’t really sticking to the ground but the temps were way down. We broke down the remainder of camp and head out. We made use of the campground’s dump station and then made the short drive out down to Grant Village. They have a full-service gas station were I was able to fill up my propane canister. After it was filled, I kept smelling gas. I didn’t know if the canister was leaking or I had some type of line leak. Eventually the smell dissipated. While I enjoyed Canyon campground, Canyon Village is too busy. Lots of people, lots of craziness. Grant Village is the opposite. The campground is not as nice. Less trees. Sites are a bit closer together. But the village part is low key. Much less people. The visitors center at Grant is not as fancy as the one at Canyon. But the ranger programs at Grant Village were a lot more personal. There is a book shop at the visitors center. A daily ranger program on the back deck, one down near the water, and one at their amphitheater. Grant also has a very large general store (just a bit smaller than the one at Fishing Bridge). Attached the store is a counter-service eatery with your standard fare (although they make an effort to have healthy choices). The eatery includes ice cream, served by the scoop. My favorite was called Moose Tracks. There are also two restaurants. One is somewhat fancy and requires reservations. The other is right on the lake and serves an Asian fusion menu. Emily acquired a liking for potstickers. Both the girls became intrigued with chopsticks. Did I mention the ranger programs? We attended a few on the back porch of the visitors center. There were others that took place down by the lake that where meant for young families. Always great topics. Then we would go to the evening programs at the amphitheater. Fairly quickly, all the rangers at Grant Village began to get to know Sarah and Emily. Both really enjoyed participating in the programs – raising their hands to answer questions. My favorite evening program was about the history of the US Army running Yellowstone. Backporch ranger program with Ranger Miles about bison. Movie in the visitors center on the Yellowstone forest fire. Ranger program near the lake was about bears and bear cubs. Evening program with Ranger Miles about the history of wolves in Yellowstone. Monday, June 27th – The girls slept in a bit. I got out the solar panel – great light here for using the solar panel to recharge the trailer’s battery system. The batteries really needed the juice. The morning was going to be quiet until…. I ran out of propane! I heard the refrigerator clicking and the check light came on. I tried to light the stove… nothing! We’d last swapped propane in Las Vegas (Day 12). I expected it to last longer. I should have just gone to St. Mary to see if they exchanged propane canisters but I thought maybe the general store at Rising Sun might. Rising Sun is about 5 miles away and (I found out) does not exchange propane canisters. I turned around and was able to do it at the grocery store in St. Mary. Then we headed back to the campsite where I swapped the propane canisters. The food in the refrigerator was saved. We rode our bikes to the Visitors Center. 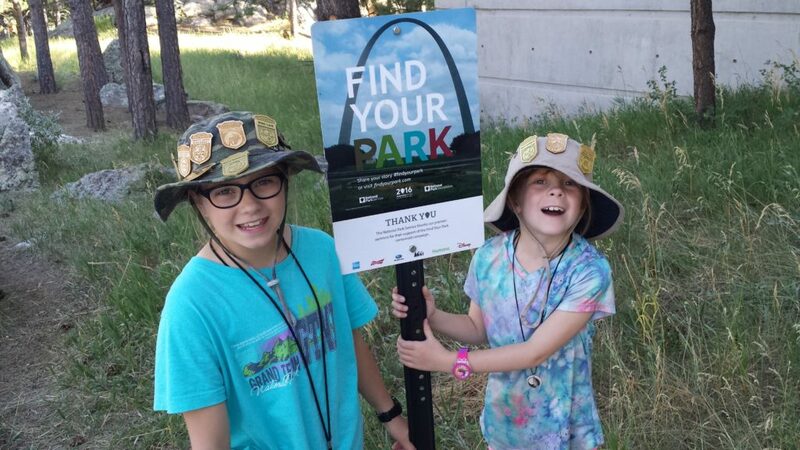 The girls got Junior Ranger books. We ate lunch in Babb, then headed into Many Glacier. We made it to the Swiftcurrent Motor Inn where our 2pm hike was meeting. The ranger leading the hike was the same ranger that lead our hike to Grinnell Lake last year (Ranger Monica). After the nature hike, we did a ranger tour of the Many Glacier Hotel. They are in the last year of the renovation plan. We had a fancy dinner at the hotel (topped off by a chocolate fondue dessert) and then drove back to camp. On the way to the Rising Sun Campground for their evening program, Sarah spotted a coyote. The evening program was about the history of the beaver in North America. Apgar Village/Fish Creek Campground, Glacier National Park, Montana. 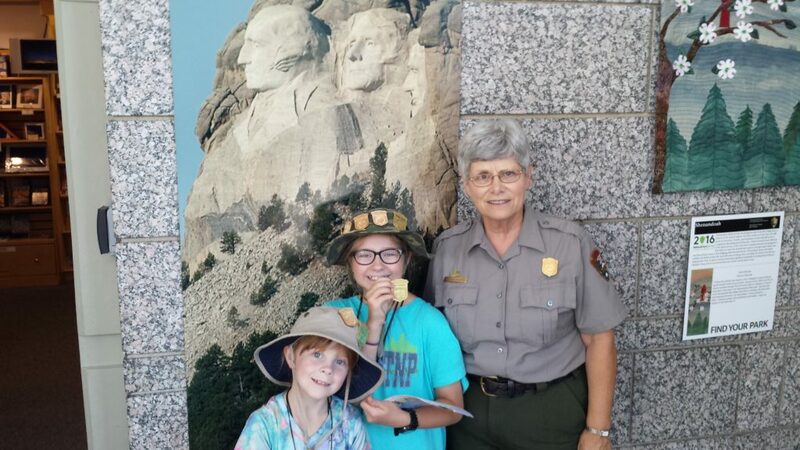 Friday, June 24th – We got up early to attend the bird watching ranger program in the morning with Ranger Sarah from Wisconsin. The girls enjoyed the walk and so did I. We were able to use our binoculars to see several birds. Rains came at about 11am. Ate a second breakfast at Eddie’s, the restaurant in Apgar Village. 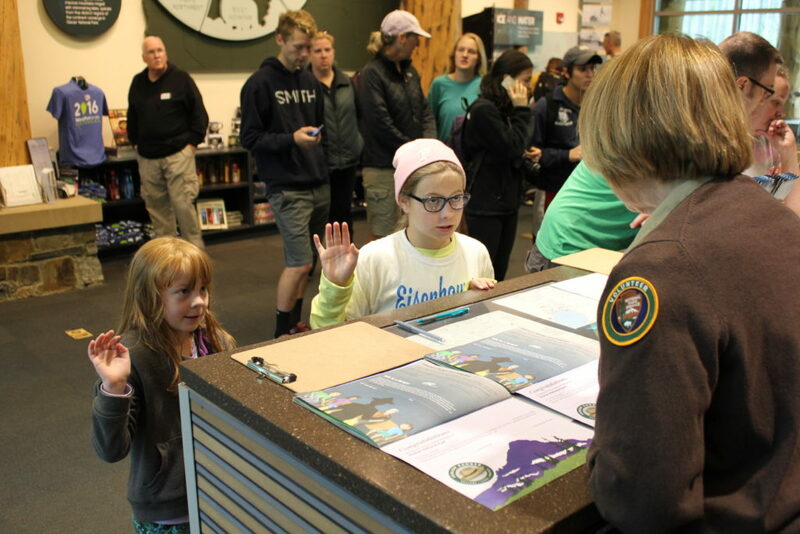 Went to the Visitors Center and the girls received their Junior Ranger badges for Glacier. Went to the 11:30am Junior Ranger program at the Nature Center in Apgar Village. The focus was for younger children; Emily had a good time but Sarah was a bit bored. Ranger Teagan ran the program. After a brief presentation she did an activity with the children were they each were an animal or plant and then formed a food web connected with string. Once one item was eliminated from the web, the rest of the food wed could feel the impact. We headed back to the trailer, hiding from the rain. 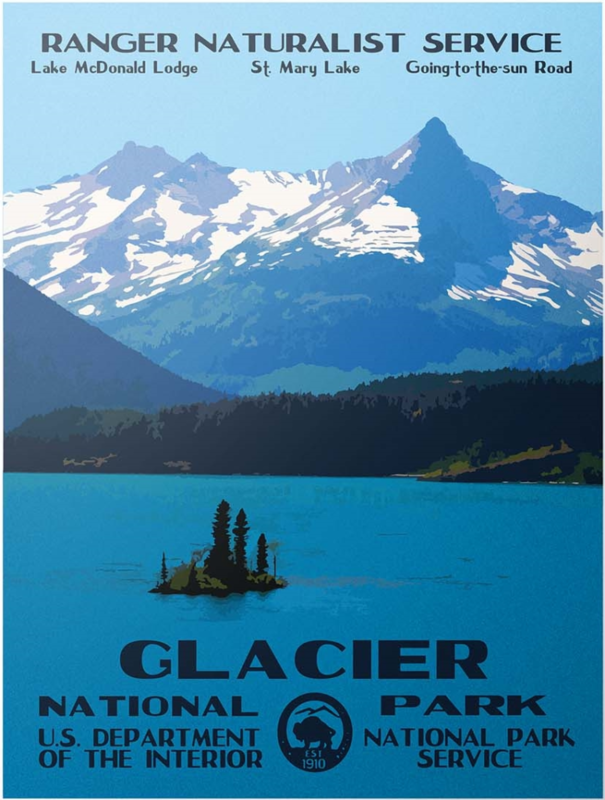 After a brief lunch and a nap, we headed back to the Nature Center for a 3pm program discussing the “Peace Park” nature of Glacier being connected to Waterton. Also talked about other Peace Parks. Next we headed to the Glacier Conservancy book store near the West Glacier train station and picked up a few items. Then to the restaurant in West Glacier for an early dinner where we ate too much. We followed the early dinner by a trip to a gift shop on the other side of the grocery store in West Glacier. Then a drive to Lake McDonald Lodge where we are awaiting the 8pm Evening Program in the auditorium on Night Creatures. We staked out a corner in the lodge’s lobby, making use of the electrical outlets to charge our laptops. With the campsite’s location in heavy trees and the poor weather, it is difficult to use the solar panel to charge our electronics. It looks like the summer plans are coming together. In an effort to capitalize on the success of last summer’s trip, this summer’s agenda is a bit more aggressive. 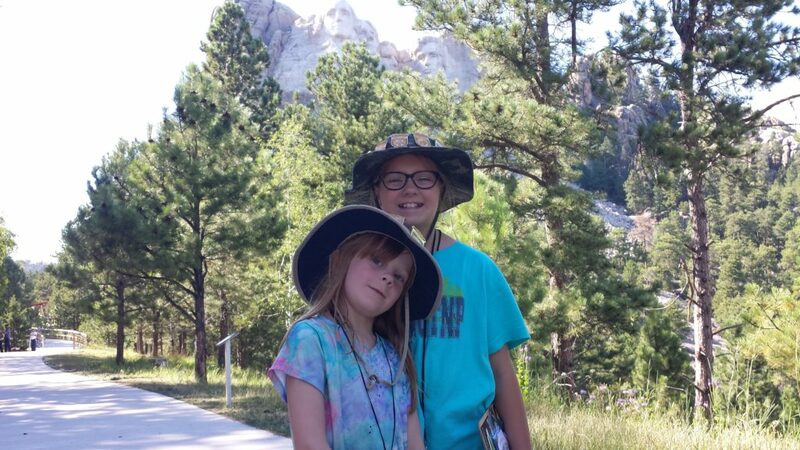 60 days and eight national parks: Yosemite, Kings Canyon, Zion, Grand Canyon’s North Rim, Bryce Canyon, Glacier, Yellowstone, and Grand Teton. I got the last reservations I needed on Friday. Yosemite seems to be the odd duck when it comes to reservations due to its popularity and scarcity of campsites in the Yosemite Valley. Last summer we were able to make only a day trip to the Yosemite Valley and had a wonderful time. But we only saw just a tiny bit of what the Valley can offer, not to mention anywhere outside the Valley. For this summer’s trip, we have reservations for a few days at a campsite on the valley floor. Yosemite will be our first national park this summer. After Yosemite, we will head south to Kings Canyon/Sequoia National Park. Although I grew up in California and attended Boy Scout camp near Kings Canyon, I have never actually been there. Then we make our way to Zion National Park followed by the North Rim of the Grand Canyon. Heading back north, we will spend a few days at Bryce Canyon National Park. This area of Utah, Arizona, and Colorado is loaded with national parks. Some folks spend the summer making the “Grand Circle Tour” seeing all of them. Our Grand Circle Tour will have to wait until another summer. I have never been to Zion, Bryce, or the Grand Canyon. 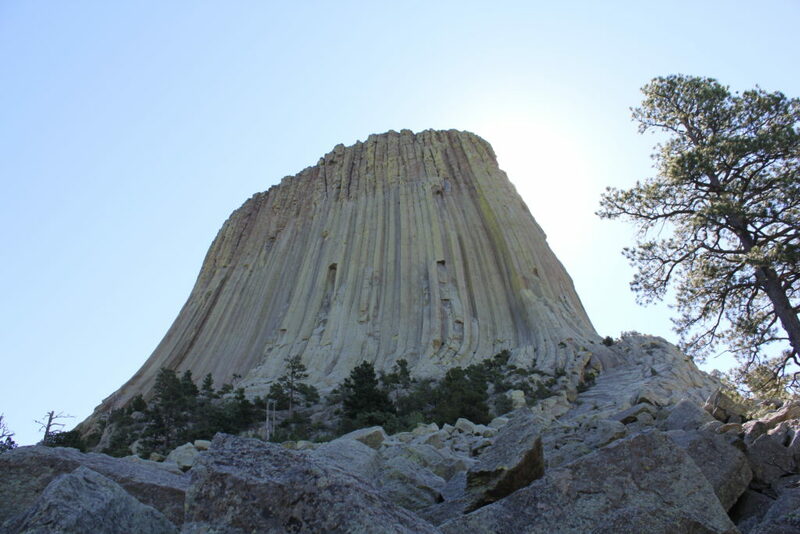 Our visit this summer should give me a good idea about this area and I will know if I will want to come back again to see other national park gems like Mesa Verde, Arches, Canyonlands, and Capitol Reef. Finding our way back to I-15, we will head north, north, north…. up to Glacier National Park. Glacier was on of our stops last year and Glacier rivals Yosemite in beauty (my opinion). Glacier also has a lot less people. We will spend a week on the west side of the park and then a week on the east side (even less people). There were lots of things we did not have time to see last year and there are many things we would like to see again. We have reservations at St. Mary Campground now, but I would be thrilled to get one of the first-come first-served spaces at Many Glacier Campground. We’ll see. Back on I-15 and heading south, we will find our way to the northern entrance into Yellowstone. Yellowstone was another park we visited last year and I am looking forward to this return trip. We are starting our stay at the Canyon Campground, located centrally on the eastern side of the figure eight loop. From here I hope to explore the Mammoth Hot Springs and the old Army garrison. We will probably make one or two twilight trips into the Lamar Valley to see the wildlife (at a safe distance). 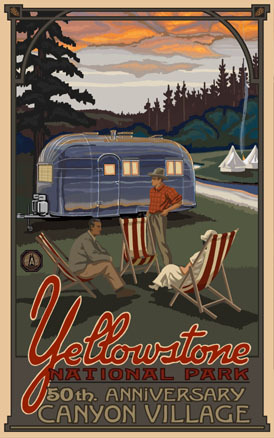 Then we move down to Grant Campground, located on the western portion of Yellowstone Lake. I would enjoy a day trip out to the Norris Geyser Basin as well as exploring Lewis Lake to the south. Our last national park this summer will be Grand Teton. This year I have reservations at their RV park on Colter Bay. This place has full hooks up for our trailer which may be helpful as temperatures climb a bit in July. 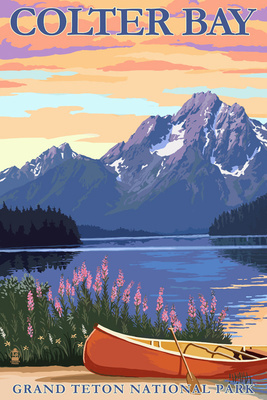 We never got to explore much of Jenny Lake or look around the Moose Visitor Center which has a few attractions nearby. Then we’ll make our way back home to Kansas. – Have fun and make sure the schedule does not become oppressive. 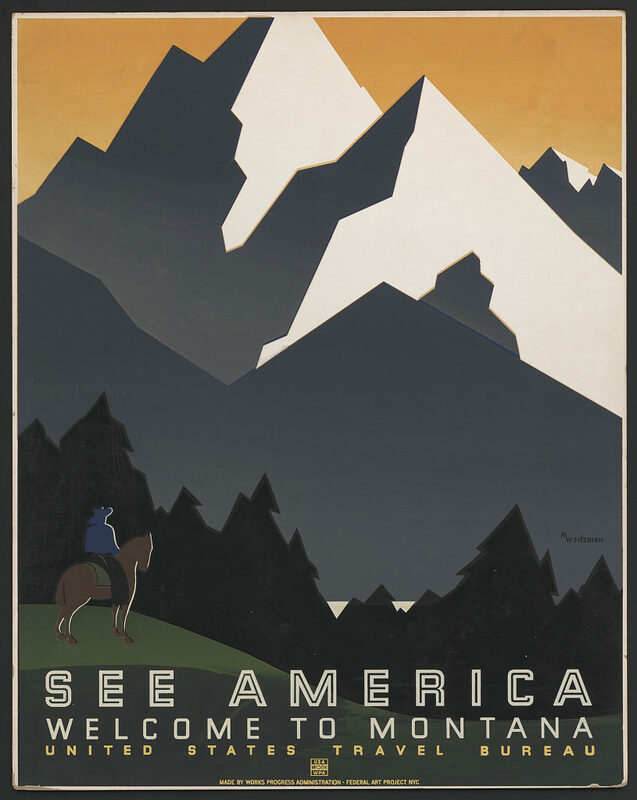 The time alloted for Yosemite, Glacier, Yellowstone, and Grand Teton should allow for a relaxed schedule. – Balance taking pictures with having fun. I usually error on the side of not taking pictures in order to make sure I am enjoying “the moment”. I think there is a balance. There are those who spend their vacation looking through the screen of a cell phone as they swing around a selfie stick. Not for me. – Make a few NPOTA contacts. I plan on getting an HF rig installed in my vehicle by mid-March. My intent is for casual operation and to keep a paper log. – I have toyed with the idea of using my PACTOR III modem to allow for an email capability. There are many locations I will be this summer that does not allow for cell or internet access. If I can design an easy way to integrate the modem into the mobile setup, testing it with a mini-laptop and am sure it will work without issue… I may do this. I had the opportunity to be a guest operator at WW1USA today. WW1USA is a special event station located at the National World War I Museum in Kansas City, MO. There was a request for operators that I saw on Larry’s List. Larry’s List is an awesome resource for hams in the greater Kansas City area. Not just another email list-serv, but a truly valuable resource in understanding what is happening in the area. From community events, swap-n-shop, club meetings, weekly nets to nearby hamfests – Larry’s List is one stop shopping for everything you need to know about amateur radio in Kansas City. I read about the opportunity to sign up for operator/logging slots during this weekends activation of WW1USA and thought it would be a neat opportunity. Arriving about 10 minutes before my shift started, I was immediately directed to a position and asked to start logging for an operator working contacts on 20 meters. The brief instructions I received was to log the callsign, name, and state of the contact. I think I recognized the logging program as N3FJPs logging program for Windows. I had used this program before during Field Day 2009 with my dad, KD6EUG. As I adjusted into the chair, my ear turned towards a speaker, my fingers pecking away entering callsigns… I noticed there were not any radios here! Each of the operating positions were laptops, using HRD to control a rig at a remote location. Pretty cool. As I believe it would have been fairly difficult to raise antennas on top of the museum and then route feedlines down to an operating room, the planners of this special event used internet connectivity. To be honest, as an operator, the fact that I was not in front of the rig was really not even apparent. After twenty minutes, I slid into the operators chair and proceeded to work contacts for the next two hours. Again, the planning effort of this operation became evident when I saw a short script in front of me for calling CQ as well as providing answers on how calling stations could QSL the contact. When a station at the distant end asked for more information about the reason for the special event, I was handed another card which talked about commemorating the failed Gallipoli campaign. I had a great time making contacts: stations all over Canada and the United States. What a fun time!